Q: How many stories can I eke out of one bus trip? A: This is the last one. I think. When I began the trip, I was determined to have writer’s eyes and ears, paying attention to the details and scribbling them down. Once I reached my destination, that plan evaporated, like a puddle in the Texas sun. Still, I now have this notebook full of notes. When I pulled it out this morning to help me recall the next leg of my journey, I realized that I had left out a little chapter about my bus ride. 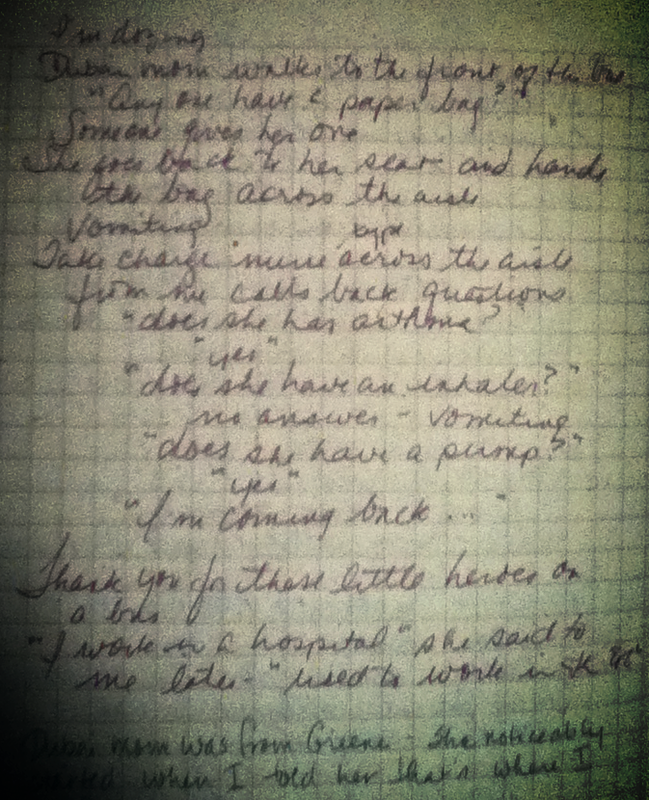 Here is the story verbatim from my notes. Dubai mom walks to the front of the bus. She goes back to her seat and hands the bag across the aisle. Take-charge nurse-type across the aisle from me calls back questions. Thank you for these little heroes on a bus. As fair and lovely as Dubai mom was, ER nurse was dark and strong. She reminded me of Hattie McDaniel who played Mammy in Gone with the Wind. I was so thankful for both of them. Dubai mom (who turned out to be from Greene) was compassionate and caring enough to not ignore the distressed passenger across the aisle from her. ER Nurse was exactly the kind of person to handle such a situation to a safe conclusion. Another woman in my vicinity kept muttering that the driver is supposed to stop if someone is sick. However, we were already an hour late, and he was hired to drive, not talk; I’m not sure that compassion was in his job description either. “Quite a ride, wasn’t it?” she said, smiling. Was she referring to the broken down bus or the vomiting woman? Hmmm, I’ve only had one occasion on a bus where I was sick. It wasn’t a fun trip.